Come fall, I find my feed flooded with pumpkin everything and apple cinnamon something. The transition from the juicy stone fruit of late summer to the warm spices of fall as the temperature starts to cool is the natural progression of things. But for me, the end of summer gets me keenly anticipating a ripe, fruitful pomegranate. Looking at its flesh dotted with ruby arils compels me to pluck every single one, nudge it between my teeth and pierce through the skin for that burst of gloriously sweet tartness. It also brings me back to my mother’s kitchen where it was my job year after year to deseed a number of them. I know there are hacks to speed things up, but the tedious, messy way makes me feel like a young girl again. So you know I go that route. Eggplant has become serious business around here. It’s ironic given that for most of my life I pushed it aside and labeled it as a “not my taste” food. I’m not sure how we slowly got reacquainted but eggplant has become a staple every week. Its subdued bitterness and spongy texture are what puts off its critics yet what lends it versatility. My favorite way is smoked, but roasting it can lend a blank canvas so the flavors and spices you toss it in get centre stage. And when it’s charred in all the right places, you’re onto something greater. I made this stuffed chicken come holiday time (why am I still talking about the holidays? It’s the last time). I used the leftover pomegranate molasses to coat the eggplant in. The teaspoon of harissa deepens the complexity of flavors and gives just the right hint of piquant. Don’t skip it. A quick roast and everything came together quickly, and in one bowl. In case you’re wondering why I skipped salting the eggplant, I find it unnecessary. If you pick a firm, fresh eggplant, it will rarely have too much liquid or bitterness to warrant the extra step. So believe me, it’s all in one bowl. Preheat oven to 400F. In a large bowl, whisk the oil, molasses, harissa, salt and pepper. 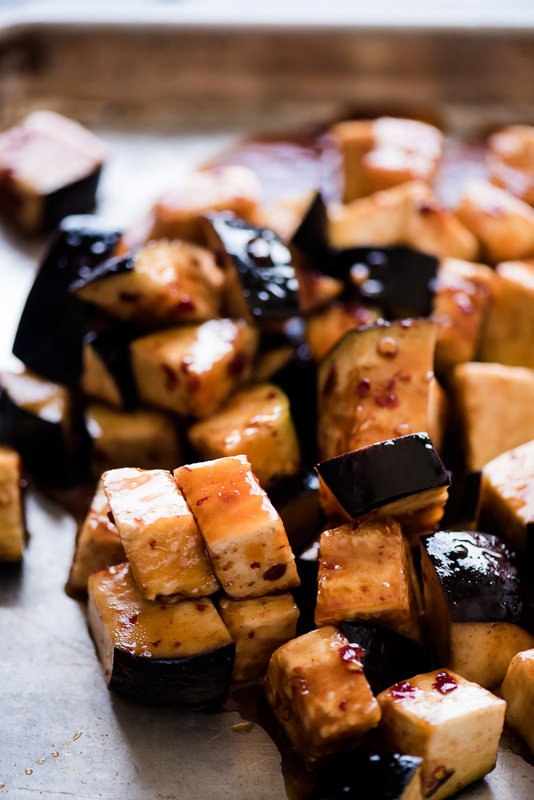 Add the eggplant and gently stir to coat in the sauce. Transfer to a baking sheet (line with parchment paper for easier clean up) and roast for 25-30 minutes or until lightly charred. Allow to cool before transferring to a plate and topping with pomegranate seeds and cilantro. Store in an airtight container for up to 5 days in the fridge or 1 month in the freezer.